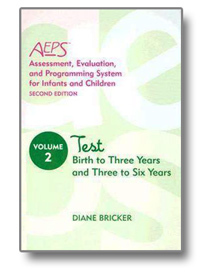 Used after the Assessment, Evaluation, and Programming System (AEPS) Test is completed and scored, this developmentally sequenced curriculum allows you to match the child's IFSP/IEP goals and objectives with activity-based interventions-beginning with simple skills and moving on to more advanced skills. 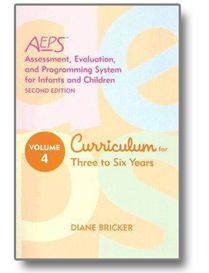 Because the AEPS Curriculum for Three to Six Years uses the same numbering system as the AEPS Test, you can easily locate activities in the curriculum that correspond to specific goals and objectives identified with the test. Age focus: 3-6. Spiral, 352 pgs.